Capital punishment for man for killing wife and four daughters. Posted On November 5, 2016 by &filed under Criminal Law News, Top Law News. 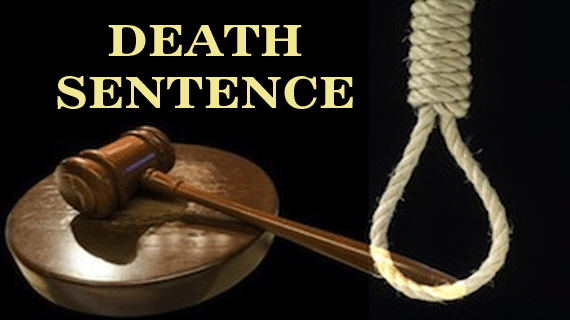 A man has been sentenced to death by a local court here for killing his wife and four daughters so that he could marry another woman in his neighbourhood. District and Sessions Judge Rajbeer Singh sentenced Ramanand to death yesterday and also slapped a fine of Rs 20,000 on the convict. According to district government counsel (DGC) Shiv Raj Yadav, Ramanand, a resident of Namdarpurwa in Dhaurehra area, had hacked his wife Sangita (35), daughters Tulsi (7), Laxmi (5), Kajal (3) and a two-month old baby daughter with a sharp edged weapon on Jan 22, 2010. After killing his entire family, Ramanand poured kerosene and burnt the bodies and tried to show that it was an incident of dacoity and murder. Yadav said during investigation, police found that Ramanand eliminated his family mercilessly with a motive to marry another woman in his neighbourhood. During trial in the court of district and sessions judge, Ramanand was found guilty of murder. 118 queries in 0.336 seconds.